The HybridLX is an innovative rollator that combines the function of a wheeled walker and a transport chair into one lightweight design. 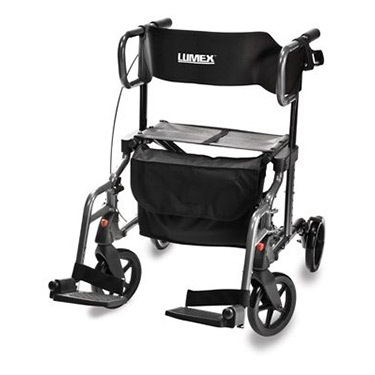 Keeping the patient's desire for independence and comfort in mind, the HybridLX is designed with secure handgrips, a comfortable and wide seat and backrest, and the effortless design to transition from a rollator to a transport chair. Available in Titanium or Blue. Approx. User Height: 5'4" - 6'2"
Dimensions when folded: 29 ½" x 9 ¼" x 30 ½"
Handle Height: 28" - 30",31" - 33",34" - 36",37" - 39"